Saturn Pyro offers in house consultancy & engineering services in addition to products & solutions it offers. The services are supported with unmatched availability of advanced portable instrumentation and software tools. Our services are concluded and complemented with solutions; effectively concluding an application. 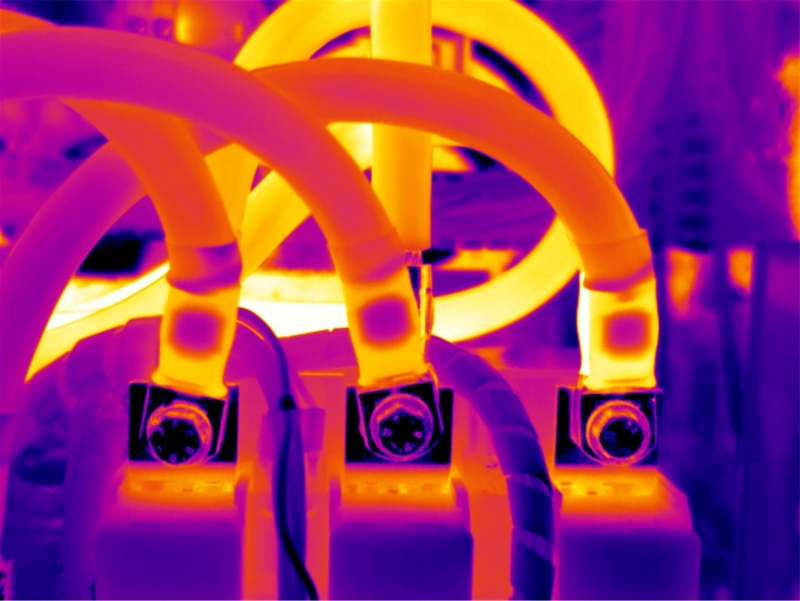 i. Infra red thermal imaging : A non-intrusive predictive maintenance tool to identify potential fire and shock hazards through infra red scanning of electrical installations : switchgear, cable terminals, bus bars, transformers, Motors, etc. Thermal signatures derived through thermal scan help in pin pointing cause of overheating and initiate preventive action in advance of hazardous conditions to materialize. Customer benefits : minimize breakdowns and repair & replacement costs, enhance uptime for production, minimize conditions that may lead to accidents and risk to human life. Customer benefit : Earth resistance test could be conducted while the installation is live and operational. iii. Load survey : Portable power, energy and power quality analyzers enable recording of electrical parameters ay key location to establish load profile. 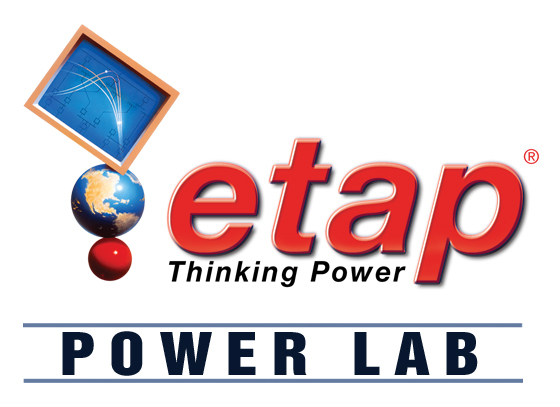 Power system studies covering the three basic requirement are conducted on ETAP software. A short-circuit study is an analysis of an electrical distribution network that determines the magnitude of the currents that may flow during an electrical fault. Data collection : Information on electric utility and customer’s installation is collected during field survey. Line diagram : A power system diagram indicating how all the components are electrically connected is generated. Computer analysis : Using ETAP software, the system data is use to input and the short-circuit currents at various points in the system are calculated. Tabulate results : The results are tabulated against ratings of equipment obtained from manufacturer. Discrepancy area are highlighted. Final Report : A detailed report including finding & recommendations for correction are generated. Short-circuit study : An analysis of available fault currents in the power system form the basis. Data collection : Detailed information is obtained on present settings and ratings of all protective devices. Manufacturer’s data : Each protective device has unique response characteristics, documented on manufacturer’s “time-current curves” that are used for analysis. Computer analysis : Allows the analysis to determine the optimum settings that will provide the best protection for the system. Tabulate results : The settings and ratings of each protective device are put in a table for comparison with present field settings and ratings. Final Report : A detailed report with recommendations is generated. Load flow studies primarily offer the voltage profile of the distribution network. A load flow study calculates the voltage drop on each feeder, the voltage at each bus, and the power flow and losses in all branch and feeder circuits. Load flow studies determine if system voltages remain within specified limits under normal or emergency operating conditions, and whether equipment such as transformers, switchgear and conductors are overloaded. Field survey to obtain cable sizes and cable lengths, bus bar area, switchgear capacities, transformer and generator capacities in terms of thermal current, reactive power compensation. 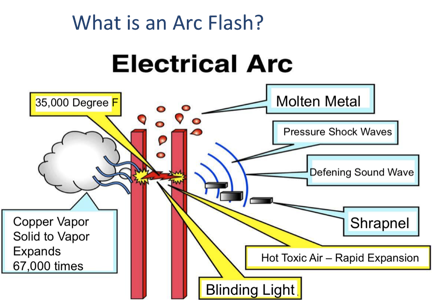 Arc flash is a condition of serious electrical hazard and is a result of an electrical fault. Other conditions that may include accidental contact with live electrical equipment, breakdown of insulation, etc. Moreover an equipment that is not adequately protected or does not have the withstand capacity for the fault current is likely to pose arc flash hazard. An arc flash is a sudden release of high energy which is proportional to available short circuit current at the location of fault. An arc flash is characterized with high explosion with temperatures of area surrounding arc flash reaching thousands of deg C in a fraction of a second. Such temperatures could set cloths on fire even from a significant distance, can cause severe burns, the bright light of flash & sound of explosion could bring temporary blindness and deafness. Molten metal of switchboards, copper from bus bars, nut bolts become shrapnel that fly in all directions at high velocity. Risk from an arc flash potential may not be entirely mitigated, however a better defense against it could be built. Arc flash protection is a step-by-step process. First step towards safety from an arc is to carry out arc flash assessment. An arc flash assessment includes identification of locations where arc flash hazard may exist and at what intensity. An awareness session would follow an arc flash assessment report. It will discuss safety practices around electrical installation and use of PPE ( personal protection equipment ), defining various terms such as flash protection boundary, limited approach, restricted approach & prohibited approach. 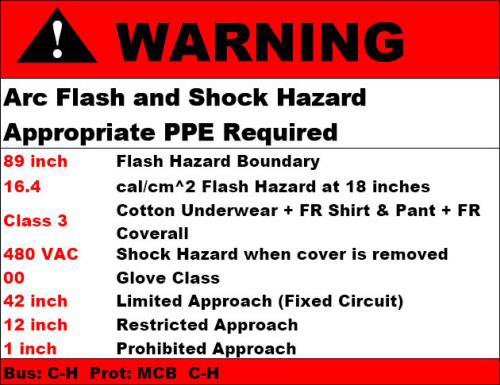 Arc flash labels are fixed at all hazardous areas with essential data that warn and instruct personnel. 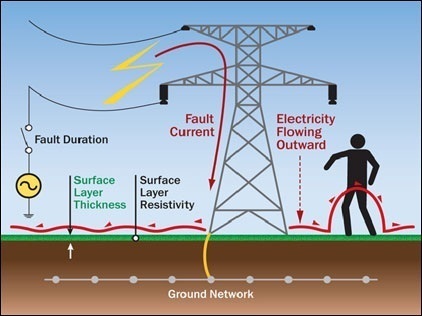 Earthing design considerations have become more complex due to increased use of power electronics, automation & IT- equipment that require not only low impedance path for protective earth but also dissipation of earth leakage currents at the fundamental frequency as well a high frequency. It also means shaping of electrical field in ground around an earth electrode to enable control of hazardous voltage gradients. Lightning protection design considerations apply to facilities with tall structures and also to sub stations, power generation plants, factories, etc. Lightning strikes involve high energy at voltages of 500 KV and currents 50 KA; although lasting for a very short duration of 10 to 50 micro seconds. Lightning can cause deaths and injuries to human beings and severe damage to buildings and structures. The threat of damage to property and equipment is growing if IT systems, communication networks and sensitive electronic devices are being used without proper protection. When lightning strikes a structure, the very high current searches for the easiest path like metal pipes, power and communication wiring, metal railings — all of which are not designed to carry high currents. This generates heating, melting, fire and smoke. Power quality refers to quality of key electrical parameters that affect the smooth and safe operation of an equipment : voltage, frequency, voltage waveform, harmonics, etc. Electrical power received from electric utility can have issues such as sags & swells, sustained over and under voltages, interruption, transient over voltages, voltage harmonic distortion. These are due to collective effect of poor line regulation, lack of voltage regulators such as tap changers, sudden switch in or switch out of large loads, over head line faults such as falling of a branch, tracking by a bird and arcing load such as a steel plant. Power quality issues are responsible for damage to or malfunction of critical equipment, loss of production, loss of revenue and high cost of repair / replacement. Comprehensive power quality survey with advanced instrumentation. This includes long term power quality disturbance monitoring covering voltage quality, transient waveform capture, harmonic assessment, high frequency impulse capture. Energy Audit is the first step to conservation of energy which is a larger objective. Energy audit analyses various energy consuming process and identifies opportunities that will help reduce energy consumption. Energy audit report offers solutions to reduce energy consumption. 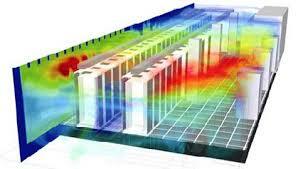 SaturnPyro Offers services in Data Center assessment with an objective to optimize the overall performance and improve reliability of the energy infra. The services would be beneficial to Enterprise Data Center, co-Location sites and Disaster back up sites alike. Saturn Pyro provides reliable engineering services such Electrical Safety Survey, Power System Studies (Short Circuit, Load Flow & Protection Discrimination on ETAP), Arc Flash Assessment & Labeling, Design Of Earthing & Lightning Protection, Measurement Of Touch & Step potentials, Power Quality Management, Energy Audit and Data Center Performance Assessment. We also provides Electrical Safety Survey such as Inspection of an electrical installation, Identification of risk (electrical hazards), Review of documentation, operations & maintenance procedures, contingency planning, Generation of report in details of risk potentials and plan for mitigation, Closing report post implementationas. Available in Penang, Johor, Kuala Lumpur (KL), Selangor and anywhere in Malaysia / Singapore.